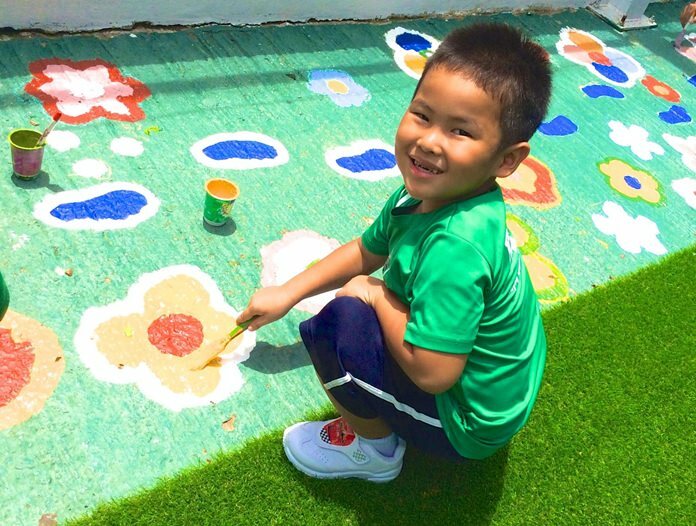 June 6 was World Environment Day and the Kindergarten at Rayong English Pro­gramme School in Ban Chang planned two events to beautify their environment, and many classroom activities to learn more about taking care of our Planet Earth. The students also wore something green to help celebrate the day. Students pull out a lot of weeds and dead plants to clean up the playground. 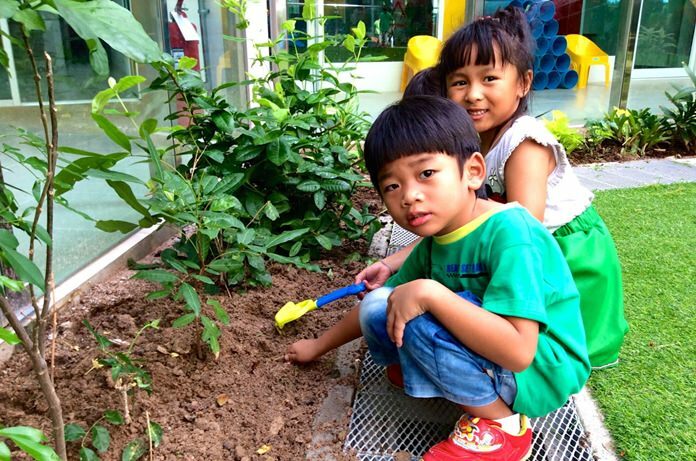 The first project was to care for the plants around their central playground. The students and teachers began by trimming some overgrown plants and then pulling weeds and dead plants from the area. Next the students dug around the plants before feeding them yummy plant food. 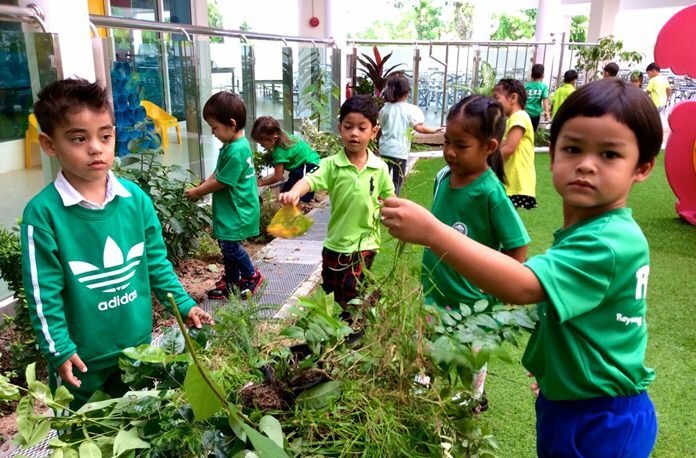 The children learned that it is important that plants get some food to stay green and healthy too. Then new fresh dirt was spread around the plants and finally the watering began to make sure all the plants had a nice refreshing drink of water. The students also enjoyed an energizing milk break after all their hard work. Digging around the plants before feeding. The second project of the day was painting “Footprints and Flowers” on plain cement walkway at another play area. First the students used chalk to draw the footprints and all different sizes of flowers. The students learned about mixing paint and how by putting colors together they can make different colors. It was exciting to see two colors change into another color, like yellow and red together made orange and red and white made pink. Students and teachers start with chalk drawing. 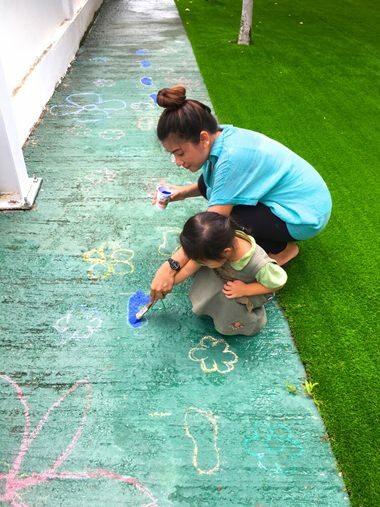 The fun began when the children dipped the paintbrush into small paint containers and started to fill in the chalk outlines. Their real brand of individual imagination was being explored as the children added their own style of creativity by using many different colors and making some flowers bigger and some smaller.